Is your oily skin troubling you? We do understand that when the skin is oily then the excessive sebum, sweat in summers can be problematic. This can also make the skin look darker in appearance. Oily skin is shiny, thick and greasy in texture. Such skin type is prone to pimples and breakouts. But the most frustrating thing about oily skin is that this oiliness makes the skin dark and dull. Oils on the face attract dust, dirt and pollution from the environment due to which not only you lose your skin complexion but pimples also erupt. So, what are the solutions if you want fairness for your oily skin? There are skin whitening skin care products that claim to give fairness on the oily skin and also control the excessive skin oils. But like we say natural beauty tips are always the best. Yes, we understand that they do take time but the results are mostly long lasting. 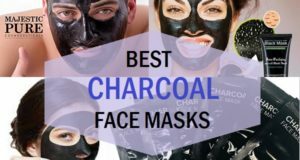 Here are face masks and face packs that will enhance the skin fairness and boost the complexion. These fairness facial packs will also decrease the sun damage and sun darkening that happens when men ride the bike or play sports in the sun. Further these packs are also excellent to whitening the skin to attain the fairer tone at least by 2-3 shades lighter. 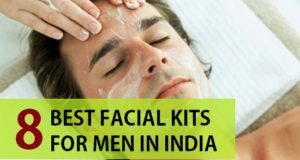 These packs will also great as oil controlling tips for men in India. 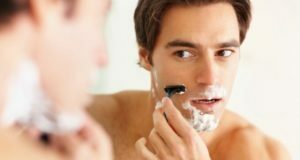 These will cure and lighten the pimple spots, scars, marks on the men’s face. Let’s know about these. Mix 2 teaspoonful of amla juice with 1 teaspoonful of aloe vera gel. Apply this evenly on the face and wait for 10 minutes. Wash with normal water. 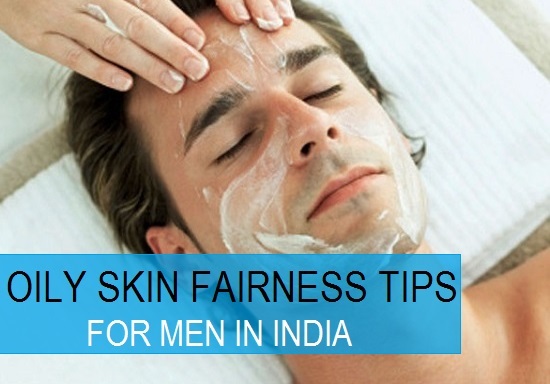 This is ideal to be done daily for fairer skin complexion. Mix 1 teaspoonful of honey with ½ teaspoonful of lemon juice. This has to be done daily for good visible results in attain a fair skin in short time. apply this on the face like you are using a skin cream. Let it work on the face for 15 minutes then rinse off. 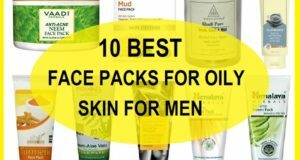 This pack is great for fair skin. Take a small slice of apple and mash using a spoon. Keep mashing until you get a smooth pulp. Then apply this pulp on the face. Go and rinse with normal tepid water after 20 minutes. The powerful combination of lemon’s vitamin C and curd’s lactic acid is also ideal to get fair skin at home for men and women. You just need to have 1 teaspoonful of lemon juice and 2 teaspoonfuls of curd. Mix and make the paste smoother. Use this on the face like a face mask. Then wait for 15 minutes then wash the face. Do this after every other day for suitable results in lightening your skin. if you are looking for a remedy that can reduce the spots then too this is ideal. Natural scrubs with natural ingredients are also brilliant to attain a glowing fair complexion. Moreover, these facial scrubbers will exfoliate the skin to give clear pores. When your pores stay clear of debris you face less skin breakouts. These scrubs will also help you in getting rid of the oily face other than giving you fairness quickly. Whichever method you choose out of the below mentioned recipes, make sure to do that 2 times in a week. This will give a smoother skin and plays an important role in making the skin complexion of men brighter and better than before. Take 2 teaspoonful of tomato juice fresh and add 1 teaspoonful of sugar in it. Mix and apply to scrub off the dead skin cells and bring back the natural fairness easily within a week. Take 3 teaspoonful of lemon juice. Add 1 teaspoonful of sugar. After mixing these two apply on the face and scrub of the skin. You can also keep the scrubber on the face for 2-3 minutes post the scrubbing so that the sugar’s glycolic acid can help to lighten the skin effectively. Let the clear skin shine on to your personality boys. If your skin is sensitive and oily for which you wish to get the fairness, then use this oatmeal scrub. Oatmeal is milder scrubbing agent then sugar so this will be appropriate. Take 2 teaspoonful of oatmeal and mix with some milk to make a paste. Use this to scrub the face and after scrubbing keep this oatmeal recipe on the face like a mask. Then wash after 2-3 minutes. This will also give hydration without making the skin greasy. Honey and sugar is the easiest scrub that gives maximum benefits for all the skin types. Mix 1 teaspoonful of sugar with 1 teaspoonful of honey. Scrub the face with this sugar exfoliant. While scrubbing make sure that you scrub for at least 2-3 minutes. But be gentle else you can get scratches if you rub very hard. So go easy dudes. Mix 1 teaspoonful of rice flour in 2 teaspoonful of papaya juice or pulp. You can get either juice of papaya or papaya pulp whichever you like. Mix them and use this great natural scrubber for healing the oily face from the excessive oils. This will give you fairness with glow. Here’s list of some natural skin whitening ingredients that can be used on their own. For these recipes you do not have to mix them with anything since they are so powerful on their own to control the oils and to give a fairer skin complexion. It boost the skin’s fairness and radiance. This will calm the inflamed and red skin due to acne and pimples. This will reduce the spots, scars and marks on the face. Absorbs the excessive sebum and oils to leave the skin oil free. Rich in the enzyme papain, papaya is one of the best fairness product that is being used in many skin whitening skin lightening solutions. Papaya is also rich in Alpha Hydroxy and Beta Hydroxy Acids that helps to revive and rejuvenate the dull, tired, oily face. Men’s skin will get dull due to dirt, pollution and oils hence, papaya can be a wonderful ingredient to get the fairness on the face and with no oils on the face. To use papaya, just take a small size and start rubbing that on the face. The juices will soak your face and then wash this after 30 minutes. Do this whenever you get papaya to eat. Just a small chunk will do the magic. Wasn’t that a very easy oily skin fairness tip? But be consistent guys. This clay occurs naturally in the earth. This mud is rich in beneficial minerals and oil absorbing properties. No one can absorb and controls the oils like the Fuller’s earth do.You many have seen that Fuller’s earth is used in a lot of homemade oily skin fairness tips for both men as well as women. Take some Multani mitti powder and make paste with water. Apply this on the face and leave for 20 minutes. See the face which is free from oils and sebum. What else an oily skinned guy wants. Right?Say bye bye to the oils. By the way this is also great for fairness. Orange juice is rich in ascorbic acid that is also known as vitamin C. Vitamin c is used extensively in skin lightening ingredients and to increase the oily skin fairness . Vitamin C enhances the skin’s texture and your facial oils are also controlled with this. Amp up your oily skin fairness with Vitamin C.
You can use orange juice on the face and rub it all over like a lotion. Wash the face after 20 minutes. This can be done whenever you get an orange. 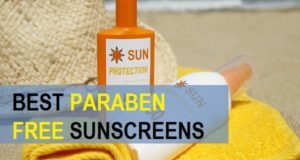 Sunscreens: Use of sunscreen should be vital since the sun darkens the skin by raising the melanin levels. So always use a moisturizer with SPF 15 at least or use a sunscreen which is matte or gel in texture. Matte or gel textured sunscreen will not make the oily skin oilier rather this will protect the skin by getting dark. 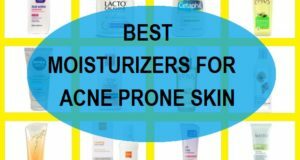 Skin care products: You should always use skin care products that are designed and formulated for oily skin. never use skin care products just like that as they may have high emollients or moisturizing agents then may clog the pores. Always use light moisturiser and skin creams which the oily skin can absorb better. In addition to these face packs for skin whitening you may also use the fairness face wash for men available in the market or the oil controlling face washes for men.